A haunting ‘ghost bike’ tribute has been installed to mark the spot where a student cyclist was killed earlier last month. 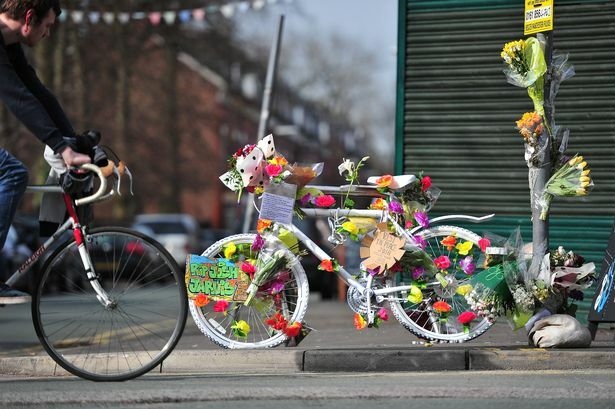 The white bike will stand on the stretch of Wilmslow Road, Fallowfield, where 21-year-old Joshua Jarvis died after being involved in a collision with a cement mixer on February 11. The initiative was launched by local residents and bike safety campaigners and has received the backing of Joshua’s grieving mum Alison, 49. The route through Manchester’s student heartland has seen a series of crashes involving cyclists in recent months and is currently undergoing a £200,000 transformation to make the road safer. Kay Fletcher, of the Fallowfield Brow Residents’ Association hopes the bike would act as a visual reminder to the 2,000 people who use Wilmslow Road every day.